Faversham – divided town of kings? Or, Faversham – disappeared town of kings? The Local Government Boundary Commission is carrying out an electoral review of Kent County Council. Radical changes are proposed for Faversham. In the current situation, the “Faversham Division” closely matches the urban footprint of the town. This can be seen in the green line that encircles Faversham in the map above. The Faversham Division is then surrounded by the “Swale East Division”, an entirely rural division. The proposals create a new division, named “Mid Swale”, which stretches from the edges of Sittingbourne in the west to the middle of Faversham in the east. Mid Swale therefore includes all of Faversham’s Priory Ward and St Ann’s Ward and the western part of Watling Ward. “Swale East” is reduced in overall size but extended to take in Faversham’s Abbey Ward and the eastern part of Watling Ward. 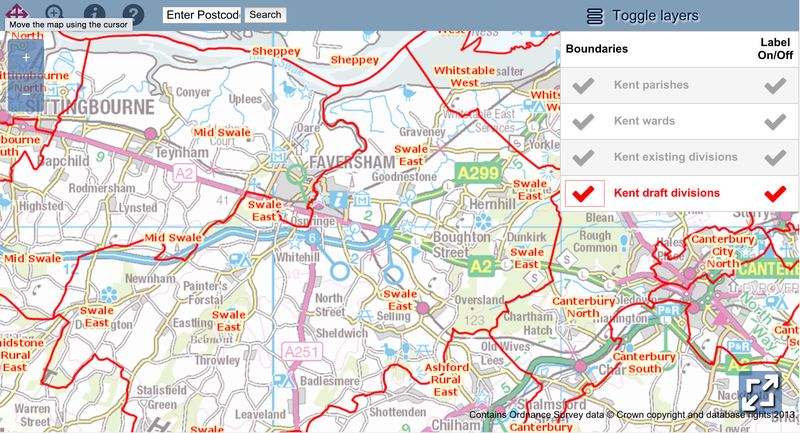 Faversham therefore sits across – is divided by – two divisions: Mid Swale and Swale East. Note – there’s no mention of Faversham in either of these names. Faversham has disappeared as a Kent County division. Faversham can clearly be seen in the upper middle part of this image, sitting among a network of urban settlements, including Sittingbourne, Canterbury, Deal and Ashford. 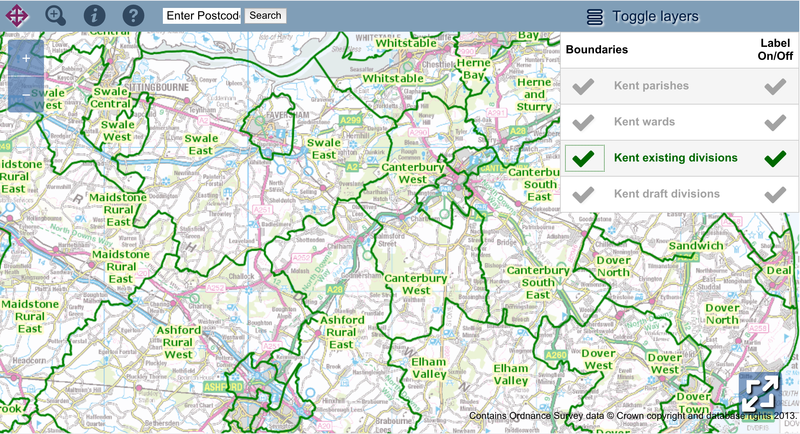 Now take a look at the proposals: Sittingbourne, Canterbury (modified), Deal and Ashford are still there. But where’s Faversham? What does this say about the town’s status? It’s certainly not a promotion. The divided town of kings has disappeared. What do you think about the proposals? 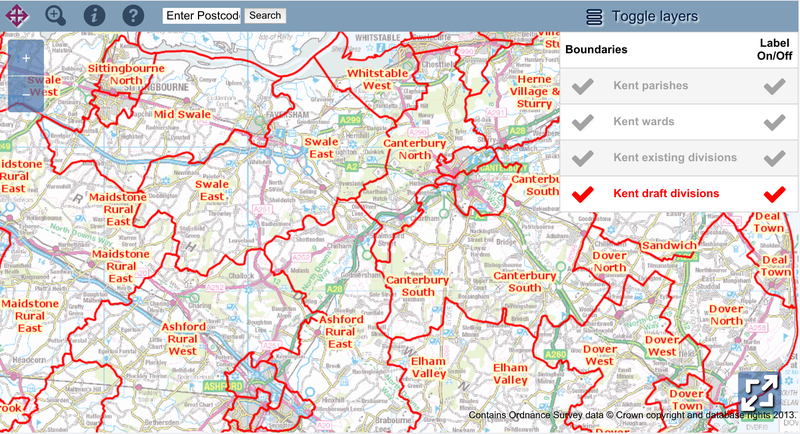 To have your say, please visit the Local Government Boundary Commission website. Previous PostFULL VOTING RESULTS for Faversham: Borough & Town CouncilsNext PostHow to deal with Faversham’s pressing housing numbers – get on the front foot! It’s great to see somebody creating a space to debate this issue. – Further erode the political integrity of the town and indeed the status of the town. Faversham has already lost a Parliamentary constituency centred on the town (in 1997) when the consitituency was enlarged to include the Borough of Maidstone wards of Bearsted, Boughton Monchelsea and Chart Sutton, Boxley, Detling and Thurnham, Downswood and Otham, Harrietsham and Lenham, Headcorn, Leeds, North Downs, Park Wood, Shepway North, Shepway South, and Sutton Valence and Langley. – Break up the voice of the community, removing the ability of the town to be represented as one community in Kent. – Pose a threat to Kent Highways being able to deal with highway issues in a holistic manner for the town. This is particularly important for campaigns such as the Faversham Action for Calmer Traffic (FACT) Campaign, which after a spate of road accidents in the town, aims to install traffic calming measures and 20mph speed limits in the town. An incohesive approach to the town’s Highways etc. will only make such important issues more difficult to deal with. – Politicially, it also appears to distribute the vote in such a way (increasing the areas covered by wards) thus making them harder for contesting candidates to fight successfully.